In 1974, music critic Jon Landau saw a 25-year-old hotshot Bruce Springsteen performing on the heels of The Wild, the Innocent & The E Street Shuffle. He famously remarked, "I saw rock and roll's future, and it's name is Bruce Springsteen." The same could probably have been said for The Hold Steady. The barroom rockers claim more influence from The Band than The Boss: Lead singer Craig Finn and guitarist Tad Kubler dreamed up the band while watching The Band's 2004 concert film, "The Last Waltz." But their crunchy, Americana-tinged roots and Finn's lyrics about the hopes and heartbreaks of fast-living youths reads straight out of the Springsteen songbook. Maybe 2006 album Boys and Girls in America isn't exactly the prodigal son of "Born to Run," but it's at least a close nephew. More than 11 guitar-heavy tracks and clocking in at just more than 40 minutes, the record sprawls, but doesn't overstay its welcome. Wistful opener "Stuck Between Stations," is a heart-breaker; Finn wears his heart on his sleeve on the acoustic "Citrus;" heck, the band takes a veering detour into alt-country for closer "Southtown Girls." But Bruce isn't the only inspiration for Finn's poetically-penned lyrics. From the first literary references to beat poets Jack Kerouac and John Berryman, the front man sinks into the nostalgia, optimism and naivety of American youth. Sure, everyone's getting high and singing along with infectious harmonies in the boozy bravado of "Chips Ahoy," but Finn's half-spoken vocals jump and jive with anxiety. The album toes the line between vintage and modern: songs like the patiently building "Hot Soft Light" wouldn't sound out of place on either a jukebox or a modern rock radio station. Two albums later, The Hold Steady ratcheted down the nervous energy with more composed efforts, Stay Positive and Heaven is Whenever. Finn jumped into the studio in July last year to record and release a solo effort. Dynamic keyboardist and mustache enthusiast Franz Nicolay jumped ship for new pursuit, anchoring punk outfit Against Me! for some time. 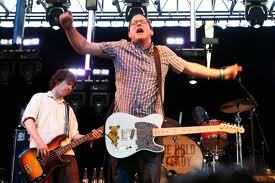 But, back in the studio in January, The Hold Steady has, well, held steady. Maybe there are some nights where Sal Paradise was right, when boys and girls in America really do have such sad times together. But in the sepia-toned, vinyl-covered world of The Hold Steady's albums, there's just nostalgia, not heartbreak. The Hold Steady on Facebook.